Whether you want to see expensive cars floating through space, or you're in need of a new gaming peripheral, or you're wondering what Apple's plans for its future tablets are, you've come to the right place – our daily tech digest, courtesy of our friends at TechRadar. It's been a momentous day for Elon Musk's SpaceX company, which launched its biggest and most powerful rocket to date – the Falcon Heavy – into orbit. Two of its three boosters also successfully returned to Earth, ready to be used again. 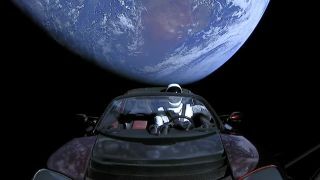 Oh, and part of the payload was a Tesla car with a dummy space traveller on board, which provided some dramatic live shots on its way to Mars (giving engineers a heap of useful data to mine along the way). In recent months Apple has been swept up in controversy over deliberately throttling the performance of older iPhones to protect the internal battery as it degrades. That story continues to play out, but Apple has hinted that such slowdowns aren't necessary on the newer iPhone 8, iPhone 8 Plus and iPhone X, thanks to some hardware and software upgrades. One day, we might even get a smartphone battery that lasts for more than a day. Augmented reality (AR) apps overlay digital graphics on top of the real world, and the BBC is launching a new app for you to try out on your Android or iOS phone. Arriving with the new BBC TV series Civilisations later in the year, the app will bring ancient artefacts mentioned on the show into your home, so you can lay the Rosetta Stone, for example, out on your kitchen table. Audio clips and annotations will be included with the graphics too. At the time of writing, the Apple Pencil only works with the iPad Pro tablets, but it sounds like Apple has more ambitious plans for its stylus in the future. A newly discovered patent from Apple shows a Pencil-like device that can write on any surface (such as a laptop touchpad) and even in thin air, thanks to sensors on board the device and cameras monitoring its position from afar. Whether it will ever become a reality remains to be seen. We love gadgets that combine several functions into one, so we're excited to see the arrival of a new gaming mouse from Lexip, which also fits in a miniature joystick and a tilting controller alongside the usual mouse-y functions. At the moment, the company is looking to raise money for the project on Kickstarter, and considering the campaign has already blown past its original funding goal, you can expect to see this sometime later in 2018.